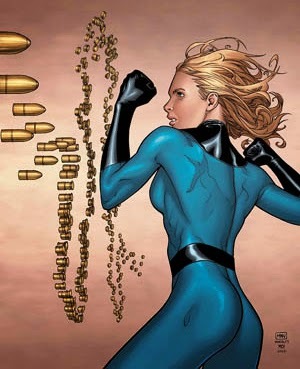 Thought Balloons - Creating Comics One Page At A Time: Why the Invisible Woman? Ben Grimm, The Thing? Check. Reed “Mr. Fantastic” Richards? Check. Johnny Storm, the Human Torch? Checkaroo. Hmmm…that makes three of the Fantastic Four, which means someone is still missing. Somewhat appropriately enough, that means the only one we haven’t seen yet is Susan Storm/Richards, AKA the Invisible Woman. But she is certainly isn’t the least of them by any means. As has been previously stated, Thing is the everyman, Mr. Fantastic is the brainy leader, and Human Torch is the guy that best represents what everyone would like to be. So what does that make Sue? Well, she’s the team’s adult. Someone has to be the responsible one. With Ben brooding about being a rock monster, Reed getting lost in SCIENCE(! ), and Johnny busy living it up as a celebrity, that leaves Sue with the job of being the most Fantastic member of the Foursome. Because it takes real strength be the one person who keeps everyone in line, especially when she’s also got two exceptional children she’s a mother to on top of it all. It’s probably a good thing she’s such an exceptional hero, because a villain in her shoes probably would have just killed them all years ago out of maddening frustration. Especially since she’s got the power set to make it happen. Hero, Mother, Wife, Sister, Friend – and with patience like hers, she’s practically a saint, too. There's actually a picture here, but it's invisible.